I am currently in the midst of crazed preparations for hosting roughly 20+ marketmanila readers for an informal barbecue lunch at the beach today, so I will be relatively quiet for the next day or two… It isn’t going to be as elaborate a set-up as other eyeballs where I have used the entire crew of Zubuchon to mobilize meals, but I hope for a more hands-on, practical meal today — paellas, grilled meat and seafood, and fresh salads. Fingers crossed for decent weather, as it has turned rather stormy and rainy suddenly over the past few days in Manila. 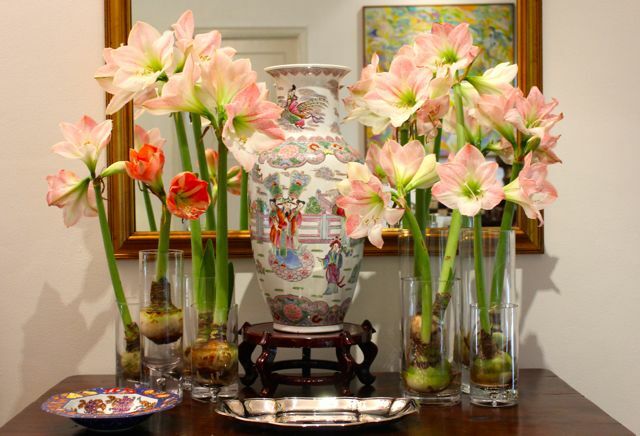 At any rate, this post features the latest use of some blooming amaryllis bulbs that I purchased last Sunday at the Centris market. For about PHP250 ($6) total, I had 9 bulbs that we put in plain glass vases with a little water, and massed them around an old Chinese vase at the entrance table. The day before, they were a centerpiece on the dining table. Just a quick post to show that you don’t have to spend a fortune to pull together an interesting flower grouping. This will last about a week indoors then will be planted in the yard after that. I hope you are all having a wonderful Philippine Independence Day/Weekend. Back with more South African posts soon. I was at Centris last Sunday and missed bumping into you just after the crack of dawn! I also saw those bulbs and contemplated on getting some and doing the same thing except I hate not being able to plant them afterwards in my tiny garden with my spot for bulbs already occupied. Super Ganda–kaloka!!!! Have a great time everyone. Wow, P250 for all 9 plants? They sell cut stargazer lilies at 3 blooms per stem at P250 also. Best Friday the 13th ever! Thank you, Marketman and to everyone I met today at the EB. My belly was full of delicious food, and my jaws ached from laughter (and chewing, of course). I am still not over the spectacular tomatoes from Toscana Farms c/o Nacho. Again, daghang salamat and I sincerely hope it will not be the last time we will meet. Please? What a great day! Fantastic food! burp!burp! Terrific new friends! Special mention to the life of the party- J__y for entertaining us! :) And a very big THANK YOU to MM and Mrs. MM for welcoming us! 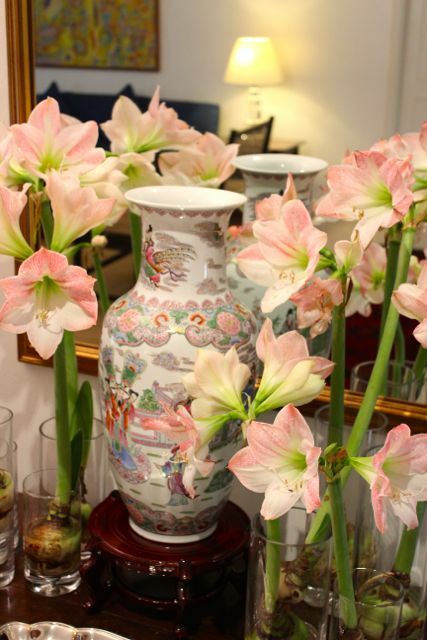 Hello-just a word of caution, as amaryllis are poisonous to dogs and cats! Wonderful venue, great food, excellent company! Mabuhay at maraming salamat, MM at sa lahat ng mga dumalo. I also dropped by Toscana Farms and got myself some of those wonderful tomatoes that Nacho brought. Thanks Nacho! Many many thanks MM and Mrs MM for once again hosting this uber crazy group that doesn’t stop laughing or eating! We had so much fun grilling and helping prepare the food(s). Both of you are always the most gracious of hosts. Thank you Thank you to everyone else who were there. You made the day so much more memorable. Thank you, Mr. and Mrs. MM, the Teen and the crew, for welcoming us into your beautiful home, the great food, and the fabulous time that was had by all. Thank you fellow guests for all the eats, the stories, belly-busting laughs and great, great company. Masaya ba kayo? OPO! Thanks very much MM and Mrs. MM for your generosity and for welcoming us to your beautiful home. We had such great fun with your superb food and hospitality. May you be blessed more for your kindness. How can we ever repay you? Hi Moni, how about our turn to cook for MM. Or has this been done before? Jenny and I would like to thank MM and Mrs. MM for an amazing Friday the 13th in their beautiful home. Thank you for the food and generosity. To the very dignified and graceful ladies and gentlemen I rode with in the van, until we meet again somewhere.